Roy Spencer has announced the beta version of V6 of the UAH lower troposphere temperature index. Sou has the story. Incidentally, Dr Spencer's announcement is very informative on how the UAH sausage is made. These have been around for a while, but I didn't know about them. Starting about 2007, NOAA has had a Carbon Tracker program. 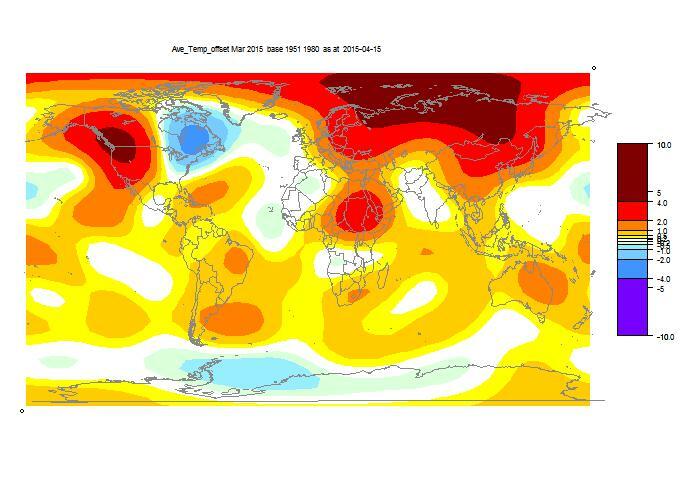 It is a kind of reanalysis program that assimilates mainly ground-based data to form a global model. I was reminded of it when I saw this recent conference paper which compared results with the two pre-OCO satellite data sets AIRS and GOSAT. And it has movies. Lots of them, from about 2000 to 2010, of both atmospheric CO2 and CH4. When the first OCO movies came out late 2014, there was some murmuring that these would upset the CO2 applecart. Those were of course for just one part of the seasonal cycle, and some features they showed, such as an Amazon Basin hotspot, could seem unexpected. But they are there on the earlier NOAA movies, although those have much more NH CO2 at that time of year. So are they reliable? Well, according to the linked paper, somewhat. They have resolution limitations, and do overstate the NH at times, but a lot seems reasonable. I'll add the link to the directory to the portals page, but of course, Moyhu has to have a gadget. This will allow you to choose by gas (CO2, CH4), year, and projection - global (Hammer), or orthographic (US-centered). Some movies are Quicktime (.mov), so you might need to have a plug-in. Others are animated GIF. One year/season is about 10 Mb, so may take a while to download. Update - I find that the CO2 movies, which are in quicktime format, don't work for me in Chrome, and it seems that there is some issue there with plugins. If you don't get an immediate response asking to allow quicktime to operate, then probably nothing will happen. The CH4 movies are in animated gif, which should be no problem. You should first choose which gas and which projection, with the radio buttons. "Hammer" is global; "ortho" shows a sphere world centered on US. Then choose a time period. If you hover the mouse over the red strip, periods will appear in faint text below the Show button. Most recent (2010) is at the top. CH4 movies are in 3-month parts, so you'll see the season appended (djf=Dec-Feb, etc). Move up or down to get the period you want, then click, and it will appear in a box below. Then you can click Show, being aware that this will download a file of 10Mb or so. CO2 will come up as a Quicktime movie, CH4 as an animated GIF. I think the CO2 movies are very timely. I think it is worth reviewing them as background to the OCO-2 results which will trickle out (very slowly so far). As foreshadowed, I've drafted a submission to the GWPF panel. It's basically a collection of the things I've been writing about in recent months, but structured according to their remit. I was glad to have the incentive to get it all together. They have required that it be in PDF format, so the draft is here (about 860 Kb). I'd be grateful for any comments. Update. They suggest less than 10 pages. I'm at 21. They allow multiple submissions, but I think I'll prune the blog posts. Are there aspects of surface temperature measurement procedures that potentially impair data quality or introduce bias and need to be critically re-examined? Are they talking about current practice? Or that of years past? Are they going to recommend how it should have been done back then? How widespread is the practice of adjusting original temperature records? What fraction of modern temperature data, as presented by CRU/GISS/NOAA/BEST, are actual original measurements, and what fraction are subject to adjustments? This is framed Steven Goddard-style. How widespread is the practice of doing arithmetic? People use records to calculate spatial averages etc, and may well wish to adjust for that purpose. As they should. Is detrending, say, an adjustment? Or calculating an anomaly? 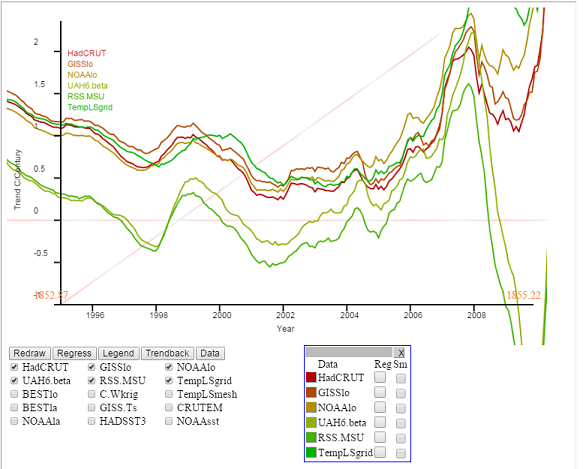 CRU/GISS/NOAA/BEST do present data. NOAA explicitly offers unadjusted and adjusted data. GHCN Daily is largely an unadjusted copy of what the national Mets have, and GHCN Monthly unadjusted is a straight average of that (for long-record stations). But the primary business of CRU/GISS/NOAA/BEST is the calculation of spatial indices. That is basically a spatial integration, and requires manipulation. They have to calculate estimates of what actually happened in sub-regions, and they publish that. Are warming and cooling adjustments equally prevalent? Goddard again. No. Why should they be? Adjustments are for the repair of bias. If the identified bias is down or up, the repair will rightly have the opposite effect. TOBS, in the US, has a clearly cooling bias. The reasons are well established in terms of observing practices of the past, and so correction is clearly warming. Are there any regions of the world where modifications appear to account for most or all of the apparent warming of recent decades? This is straight Homewood. There may be some. The inference is that there was a cooling bias that masked all of the warming. But it isn't common. If it helps them, the broad regional breakdown is here. Are the adjustment procedures clearly documented, objective, reproducible and scientifically defensible? How much statistical uncertainty is introduced with each step in homogeneity adjustments and smoothing? Well, it will be interesting if naysayers finally bring themselves to read the papers of Menne and Williams etc. But agenda may intrude. Statistical uncertainty of what, I wonder? Anyway, I'll probably send in a submission. I've been working out how to convert the html of blog posts to pdf. We'll see. "Top Scientists Start To Examine Adjusted Global Warming Figures"
"Top Scientists Start To Examine Fiddled Global Warming Figures"
I guess GWPF likes to sound a little more objective. "It was entirely prompted by the two articles I wrote in the Sunday Telegraph on 24n January and 7 February, which as I made clear at the time were directly inspired by your own spectacular work on South America and the Arctic." As several commenters have noted, GISS is up by 0.06°C, from 0.78 to 0.84. I had expected a small rise; David Appell was close. That's one of the hottest months on record, and makes 2015 a very warm year so far. TempLS rose by a smaller amount, and the troposphere indices declined. Here is the GISS map. As with TempLS, N America is bipolar (more warm than cold), Russia and N Europe hot, and a hotspot near Sudan. This post is a bit late this month. I've been holding it waiting for GHCN results from China and Canada. China has finally come in - still no Canada. Anyway, the TempLS mesh index was 0.717°C, slightly up from Feb 0.698. One reason for delay was that I had predicted a slight rise, and I didn't want that result to be unsettled. The margin was very fine, but China raised it somewhat. It's still possible that Canada could bring it down. As mentioned in earlier posts, although temperatures are not changing rapidly, they are very warm. The first three months of 2015 were each warmer than any month of 2014 (thanks, MMM). The NCEP/NCAR index for April has a sudden dip. The greatest warmth was in the North - Siberia and Canada, extending into N Europe and W Canada. Coldest was again East N America, and also a patch in N Atlantic. Troposphere measures (UAH and RSS) were down slightly, but Roy Spencer noted a similar pattern. Surface coldness was less extreme in E N America. As with the trend page, I show a graph of the time series. Data options supplied are the usual collection of global temperatures, but you can also supply your own. And there is a color triangle, in which each dot (square) is a start/end year combination, with the color showing the corresponding trend. With the trend page, you could click on that to change the range; there were also controls in the graph. Now you just run the mouse over the triangle, and the red trend line on the plot moves dynamically, and the information is echoed top right. The triangle is oriented so the NE corner is starting ending 2014, and SE is the whole range. x axis is start year, y-axis is end year. The info in the upper triangle will tell you where you are. I haven't given a color key, because you get an instant print response - basically, rainbow with red for warming. To change data set, select from the menu and then press the "Enter data" button. To enter your own, just convert it to a comma separated one-line list, and paste into the text window, and then click "Enter Data". The button enters the last thing you changed (text window or selector). If you enter data, it is attached to the choice "User Data" in the data menu. Initially, I have put a sinusoid there, which you can select. It shows graphically how the trend works as a derivative. The CI's are, like the trend page, calculated as AR(1) autocorrelated series using the Quenouille approx. Usually correlation is less for annual data. I have shown trends of all lengths, but too short trends will have unreliable or NaN CI's. Most of the NCEP data for March global surface temperature is in, and despite some cooling at the end, it still looks to be a little warmer than February. Probably less than May 2014, but higher than any other month in 2014 (or 2015). I'd expect this to be reflected in surface temps. I've fixed a bug where in the daily NCEP table, dates were written one day ahead (on Australian time). Dates on the maps were correct.